If you like to camp or take long hikes, you probably carry a bit of equipment with you on the trails. If you want to eat a hot meal, some of those things you need to bring are cooking tools. Packing this equipment can get heavy and take up a lot of precious space in your backpack. It’s helpful to know exactly which cooking tools you’ll need before you pack, and the best ones will get the job done right while being relatively lightweight. Here, Ranger Mac will go over some of the best cooking tools you can take with you out on the trail! Cooking Sets – It’s convenient for hikers to have a set of cookware that stacks inside itself, giving you optimal space in your backpack. Some sets include mugs, cups, and plates that also nest inside the set. These sets tend to be relatively durable and lightweight, but don't offer much variety. Individual Pieces - If you only need a few pieces, then it’s better to choose an option that’s right for you based on single items, so you’re not dragging along unnecessary ones. This option also allows you to build the set you need as you need it, giving you extra adaptability with your camping cookware. If you end up needing a lot of supplies, however, this method isn’t ideal for decreasing the weight of your backpack. Both of these lists combined are just a portion of what you can bring as your camp cooking collection. If you camp often, you might find that you need a large amount of equipment and then choose which pieces to bring on any given trip, as needed. There are many options when it comes to the material that your cookware is made of. Each choice has pros and cons, and will come down to personal preference and situation. Aluminum - This type of metal is lightweight, affordable, and a great conductor of heat. It can rust faster and dent easier than some other types of metal though. Stainless Steel - This type of metal is tougher and more scratch resistant than aluminum. It’s heavier than aluminum and isn’t as great a conductor of heat. Cast Iron – This metal is extremely tough and ideal for cooking over a fire. However, it’s not great for carrying in a backpack due to its weight, and it does require a certain amount of care for keeping it clean. French Press - For those wanting high quality campfire coffee. Extending Forks - These can make it fun and easy to roast marshmallows, hotdogs, and more. Popcorn Popper - This is always a fun addition to any camp out. Cooking Iron – This helps you make hot sandwiches over the campfire. 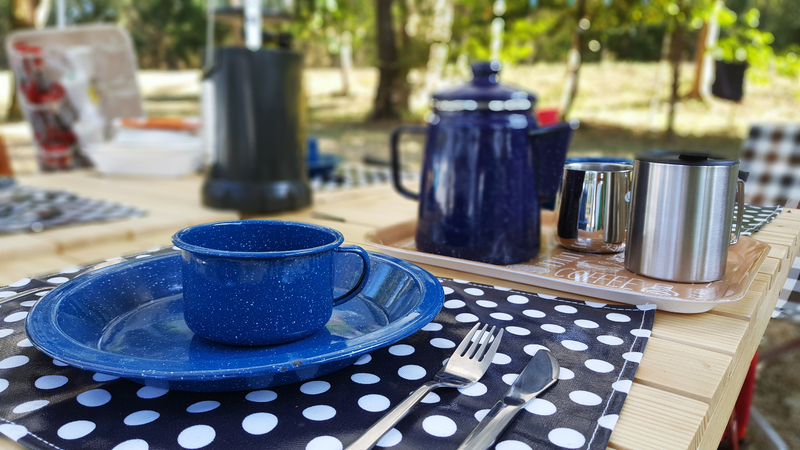 With so many options out there for cooking tools, it can be overwhelming to choose your camping/hiking cookware. Be careful, or you might end up feeling like you need every little gadget that you come across! The lists above can help you get started organizing and planning your equipment, so that you only take what you need. Especially if you’re backpacking, it’s important to keep your cooking tools lightweight and compact. Get those pots and pans, along with a good water bottle, and hit those trails. If you’re debating where to go next for your trip, consider one of these underrated national parks!